Your business or your career isn’t the Pony Express. The Pony Express had a unique business model that seems to be how many people approach their life. They hop from horse to horse. That business model worked for the Pony Express because they had fresh fast horses poised and ready at fixed spots along the route. 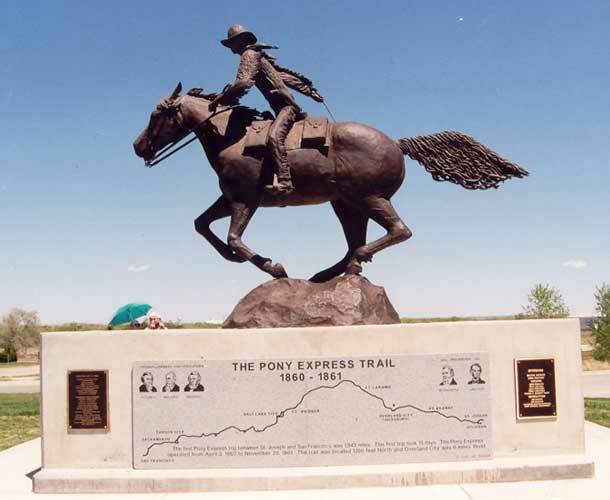 The Pony Express rider knew where he was starting his journey, and equally important – he knew where he was going. A common problem today is the urge to jump from one strategy or tactic to another. There are tons of people who are busy hopping around, but they’re not moving forward. When we embark on a journey toward higher performance we’re almost always in uncharted water. Think about it. If we knew exactly how to go from where we’re at to higher performance, then we’d just follow the sign posts and make it a certainty. Sadly, higher performance is not a certainty. If it were, then everybody would be a high achiever. There are inherent risks in our careers and our enterprises. Go to any lending institution and you’ll be required to show your plans. The bankers want to see what the risks are. They also want to see the potential rewards. Typically, a committee will discuss your plans to see if they think your venture is worth the risk. They’re interested in how reasonable and realistic it is. All of that would be unnecessary if there were some guaranteed steps we could take to achieve success. Do steps 1, 2, 3 and 4 – and BAM! – you’re a success! It doesn’t work that way. That’s the problem with people who want to jump from horse to horse. We see what worked for one person and we incorrectly assume it’ll work for us. Maybe. Maybe not. Not all horses are created equal. Not all circumstances are equal. What worked for one person may fail miserably for you. That’s why business is so challenging – and exciting. It’s risky. Succeed and you can be rewarded handsomely. Fail and you can quit, or try again! One of the toughest challenges facing many of my clients is choosing a strategy, developing a plan, selecting a course of action (or a variety of other things) – then working it for all it’s worth until they see that it won’t work – or until it does work. They’re Pony Express riders, but they don’t have fresh fast horses at set places along the course toward their final destination. They’re just constantly jumping from horse to horse looking for the one that will propel them forward. For example, a person decides to ride the horse of Quality. They produce a superior product, but it’s far from being the lowest priced product of its kind. The Mercedes dealerships aren’t exactly giving away cars. If you want quality, you’ll have to be willing to pay for it. The producer has to prove that their quality is well worth the investment. Price pressures the person riding the Quality horse. They find the Quality horse is growing difficult to ride. They’d like to find an easier horse. Along comes a horse called Low Price. They jump off the Quality horse and board the Low Price horse. Now, all the momentum that might have been gained aboard Quality are gone! Worse yet, this new horse called Low Price isn’t so easy to ride either. The business – or the person – who jumped from one horse to another is losing ground. It’s like playing the board game, Sorry. They’re bumped off course and knocked all the way back to the starting point. Except it’s worse. Now, they’ve shown people they’re fickle, undecided about who they are…and who they want to be. They’ve lost their uniqueness in the quest to find the latest, greatest secret. The search for an easier solution has a high price. Failure. Decide what horse to ride, then ride that horse. If you’re riding the horse of Selection, Value or Quality – or a variety of any other horses – commit to it. Don’t try to narrow it down to your 3 favorite horses. Remember, you can only ride one horse at a time. Dragging 2 other horses behind won’t work. It slows you down. Pick ONE. And only one! If the riding is slow at first, don’t quit. You don’t know how long the ride will take. Maybe you’ll find success soon. Maybe not. High achievement takes time. I can’t tell you how long it takes because that’s one of the variables – one of the big unknowns of business and careers. And achievement in general. We just don’t know how long it’ll take. It takes however long it takes. If the riding is difficult, don’t quit. Many horses appear to be an easier ride when nobody is on their back. The longer you ride the horse you’re on, the more acquainted you become. That makes you a better rider. When you jump off one horse and onto another, you start that learning curve all over again. You’ll know if the horse you’re riding will get you there or not…but you won’t know that immediately. Belief is a critical component of your strategy. You must select a strategy that you can fully embrace. Your faith and confidence in the horse you choose is one of the biggest decisions you’ll make. Equally important is your belief that YOU can ride that horse successfully to your destination. If you can’t see yourself achieving greatness…you’re in trouble. If you can’t see yourself achieving greatness aboard the horse you’ve chosen…you’re in trouble. Both rider and horse must cross the finish line.